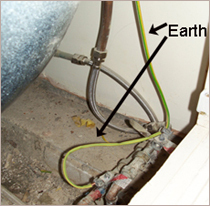 In the UK earthing is used as a means to reduce the chance of you getting a an electric shock in the event of a fault. Electricity will, given a chance, want to travel to the actual earth by the most direct route. If you get in it's way it will go through you and potentially cause severe injury. By wiring your home with earth cables this allows a safer path for electricity to flow in the event of a fault. Your home has several earthing arrangements. Do NOT tamper with them. 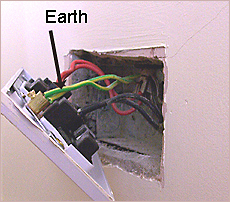 -All domestic wiring circuits have an earth cable going back to earth . 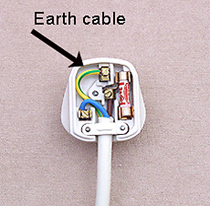 (as part of the "Twin and Earth" cable). These connect back to your consumer unit which connects to the main earth terminal. -Supplementary earth bonding is used in special locations like bathrooms. Links all non electrical metal things like metal waste pipes, baths, taps etc. -All appliances with an electrical flex ( toasters kettles etc.) 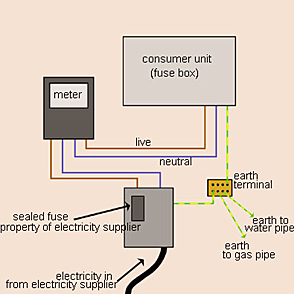 will have an earth cable which connects to your house earthing when you plug them in. The exception are items which are double insulated and therefore do not require an earth. They are clearly marked with a double insulation sign. All of these earthing arrangements will have been installed when your house was wired. They form an essential part of electrical safety and should never be tampered with or removed. 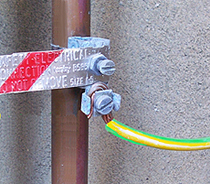 Bonding of incoming water pipe using earthing strap.